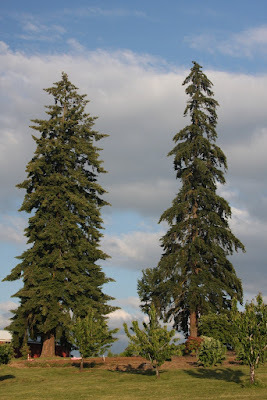 At the end of last week's Flora Wonder Blog I mentioned in passing that conifers flower, but just express themselves differently than what we normally think of as a “wildflower.” However, from an accurate point of view, you can regard the tallest tree on earth, Sequoia sempervirens, the largest tree on earth, Sequoiadendron giganteum, the oldest tree on earth, Picea abies – found in Sweden at 9,500 years old – and the most rare* conifer on earth, Abies beshanzuensis (Debreczy and Racz in Conifers Around the World) as “wildflowers.” The definition of a wildflower is the flower of a plant that normally grows in fields, forests etc., without human intervention. So conifers qualify as wildflowers, and every time you climb a mountain or wander along a stream, think of the conifers – and everything else too – as wildflowers. 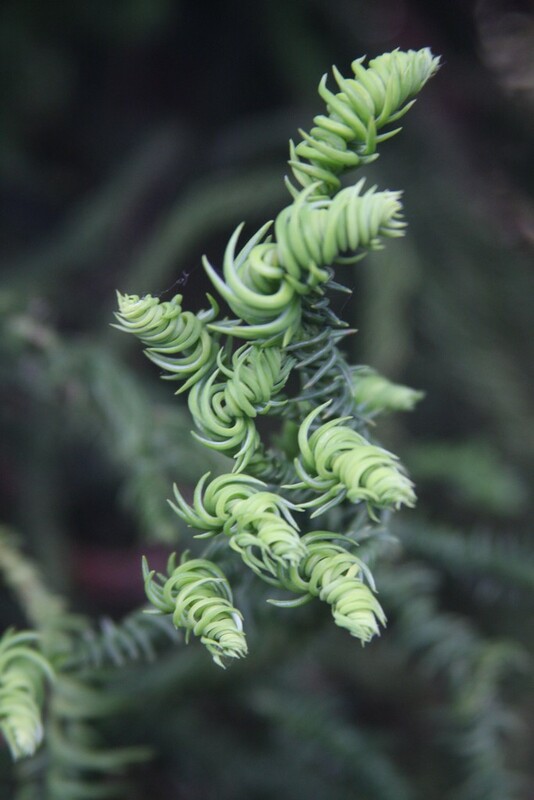 *The most rare plant on earth must be Pennantia baylisiana, endemic to the Three Kings Islands, New Zealand, where only one plant is known to exist. 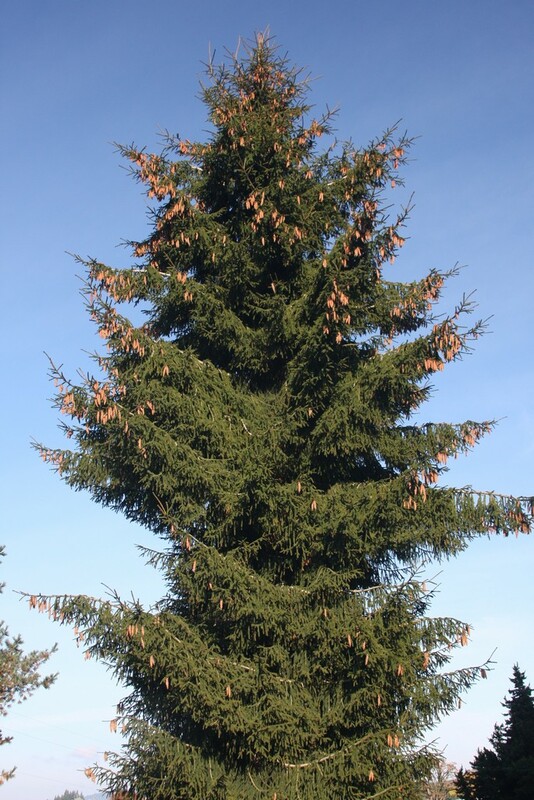 It is a female tree, and though it has been propagated by cuttings, the lonely spinster will not be able to reproduce the normal way. More used to exist, but they were eliminated by grazing. This solo female is in the taxonomic class Magnoliopsida. Ok, back to conifers. 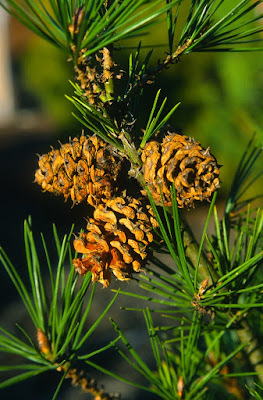 They reproduce by the seeds or fruits from the female flower (usually cones). 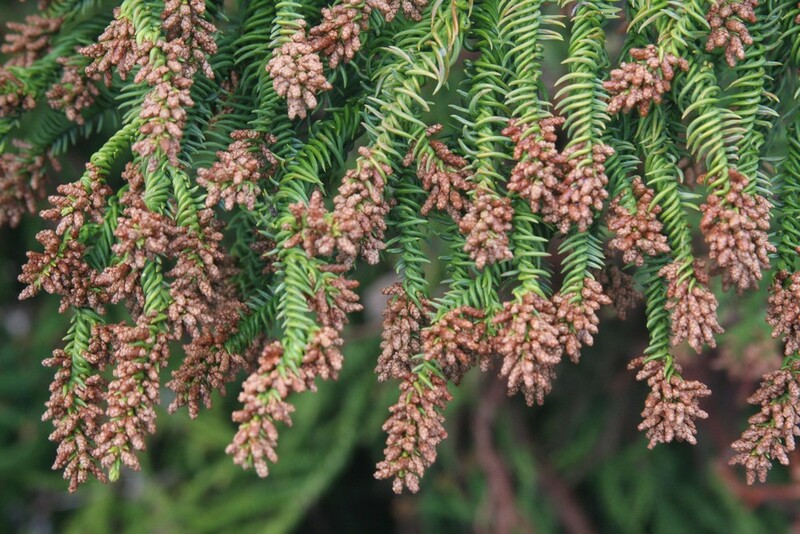 Most species are monoecious, with flowers of both sexes on the same tree; “while species in the yew family, and many junipers, are dioecious, that is the flowers of the two sexes are borne on separate plants.” (Rushforth in Conifers). 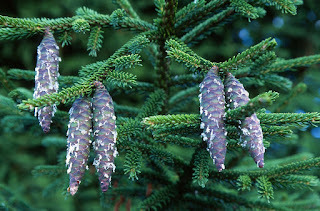 Abies, the “true firs,” assist in their pollination with female cones rising erect, and usually on the upper portions of the trees. 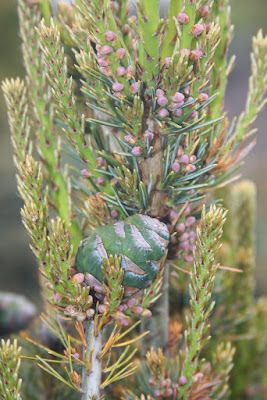 Abies x arnoldiana was a hybrid of Abies veitchii x Abies koreana, and the offspring are intermediate between the parents. 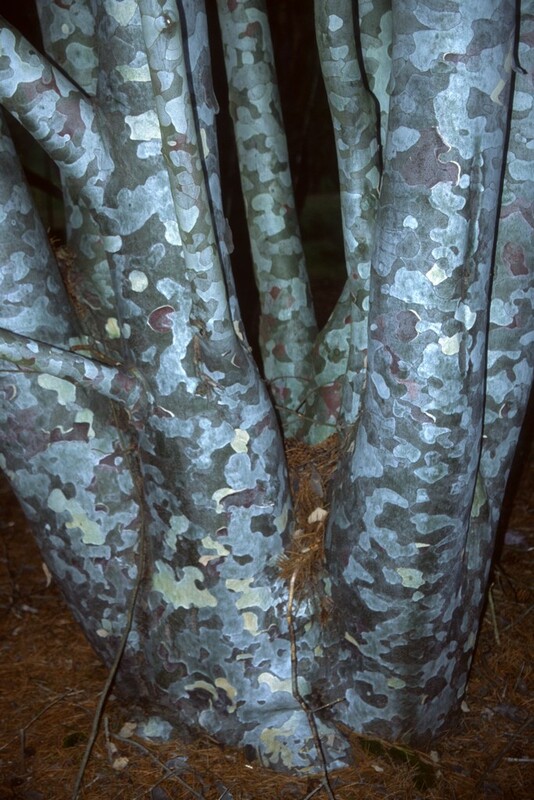 The cultivar 'Poulsen' is interesting for a prostrate form, and my 25-year-old specimen has rambled to 15' wide and is only 3' tall. By June numerous purple cones sit atop the foliage, something like candles on a birthday cake. 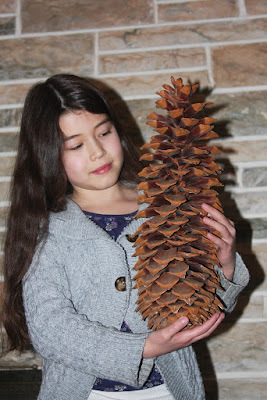 If I wasn't so busy trying to make a living I would germinate some of the seed and see what happens, for in the Flora Wonder Arboretum one never knows who is pollinating who. In theory, every single female cone could be receiving pollen from a different male cone in the collection. 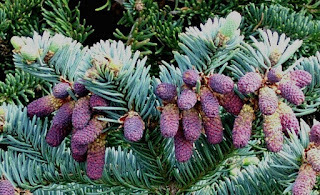 Abies bracteata is the “Bristlecone fir” or the “Santa Lucia fir,” as it is native to the Santa Lucia Mountains of coastal California. Santa Lucia*, or Saint Lucy, was a young Christian martyr, known as Lucia of Syracuse (283-304). While still a virgin she was tortured by eye-gouging, then bundles of wood were placed about her and set on fire, but they would not burn. 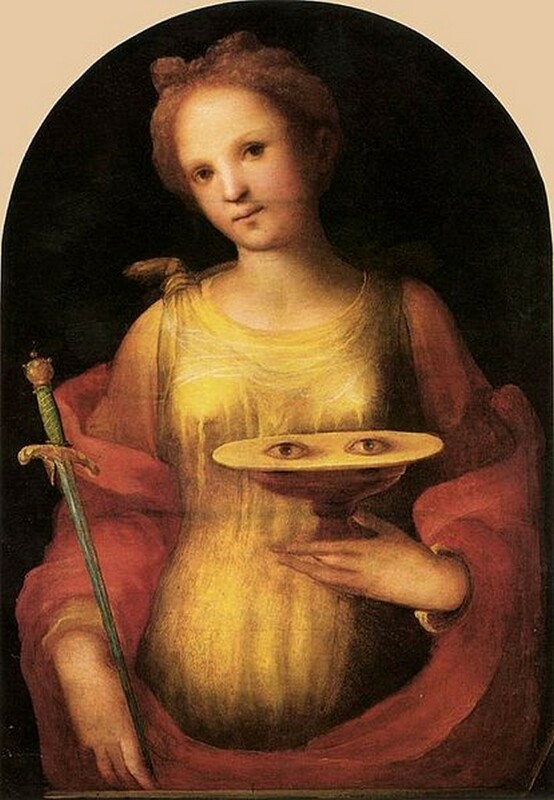 Finally she met her death by the sword, and when her body was prepared for burial it was discovered that her eyes had been miraculously restored. Since Catholics named much of California, it is not surprising that a mountain range would bear her name. 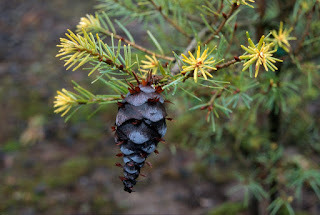 I have seen Abies bracteata in the wild, but at the time of my trip the cones had disintegrated and I could only collect seed from the ground. A year ago I obtained intact cones form the Strybing Arboretum in San Francisco, and my wife kindly baked, then shellacked them for preservation. 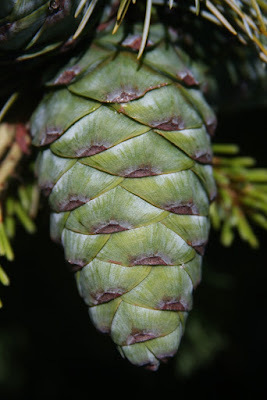 She thinks my desires are simple and cute, but she doesn't realize that I have been growing Abies bracteata, and have wanted a preserved cone for my entire career. *Santa Lucia's name shares the root luc with the Latin word for light, lux. Therefore she was named as the patron saint of the blind and those with poor eye-sight. I was once told by a dendrological cognoscente that Abies procera 'Glauca Nana' was invalidly named, since the International Code of Nomenclature declared that Latin names were no longer valid after the 1950's, blah blah blah. 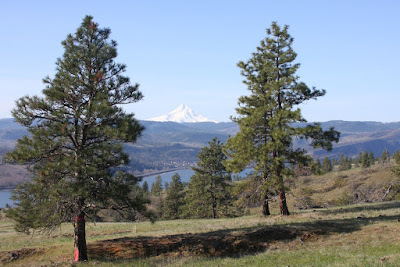 Yes, I know that, but my start came from the Otto Solburger collection, north of North Plains, Oregon, and he collected it – from where I don't know – before the damn code went into effect. Simply put, it is a more compact form of the species, but still features the delicious erect cones of Abies procera. 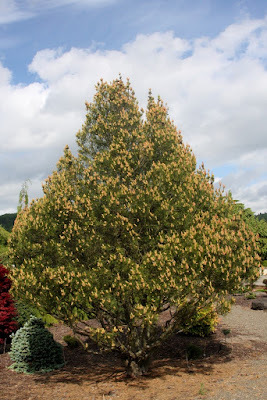 We no longer propagate it, but I still have one specimen in the Flora Wonder Arboretum. 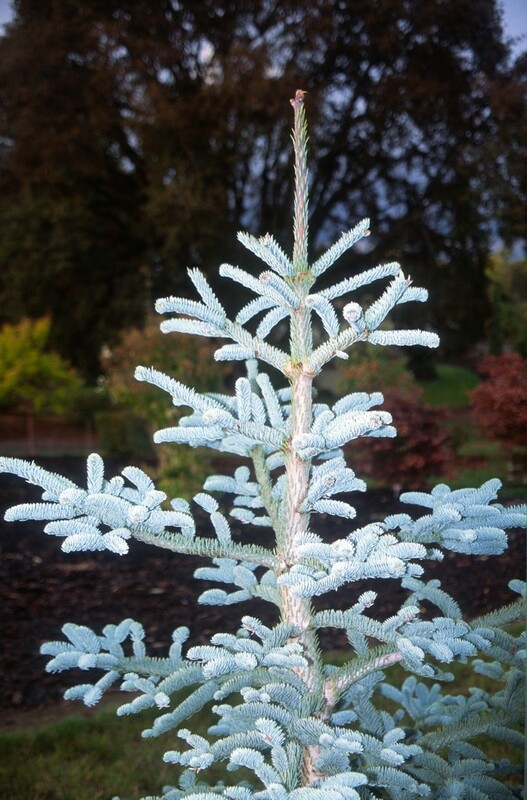 Abies procera 'Silver' is a selection that I raised from purchased seed, as early in my career I had no idea what I was doing and I propagated many species from seed. I was trying to find my company's definition, and from there I...stumbled into what I am now, whatever that is. Anyway, cones sit atop the astounding silver-blue foliage, and the procera species has the most impressive female cones than any other Abies I grow. 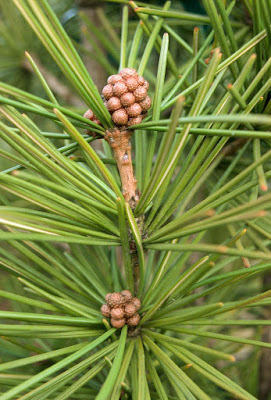 Pinus parviflora was named for Latin parvis for “small” and flos for “flower,” and this relative description – which seems inappropriate to me – was rendered by Philipp von Siebold in 1842 when he botanized in Japan. 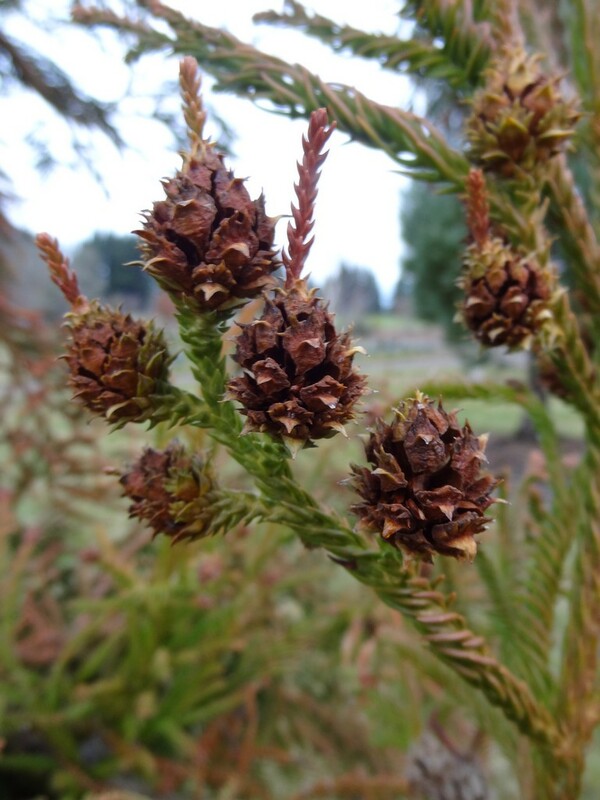 Parviflora is probably my favorite species of all pines, and it's sad that a more poetic name wasn't bestowed upon it. 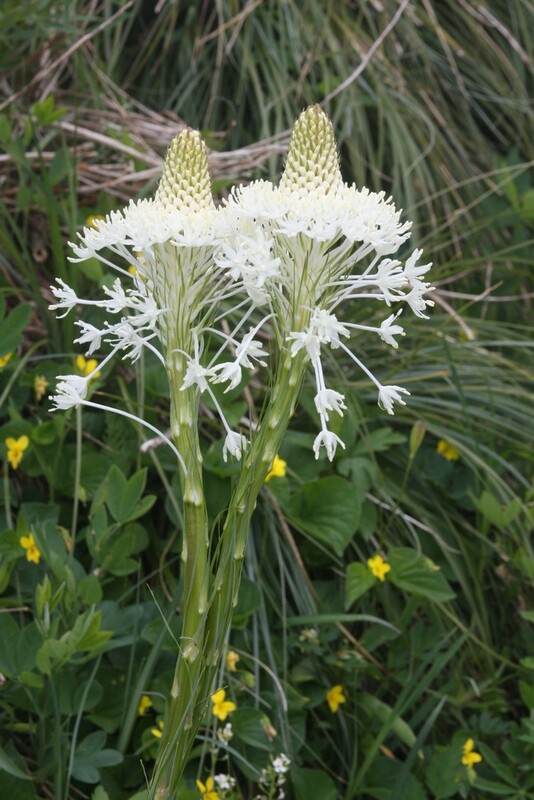 It is native from southern Hokkaido to Kyushu and occurs on higher slopes along with montane-subalpine flora. It is distinguished by curved blue-green needles and sessile* cones that remain on the tree for quite a few years. I have a huge collection of parviflora cultivars, and thank goodness for whoever invented plant labels, as I would be mixing them all up otherwise. Some, like 'Hagoromo' and 'Fukuzumi', can be touchy, meaning that they can die at any point, when a week before they looked great. 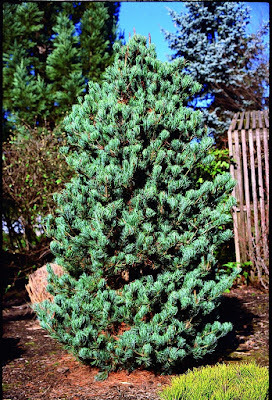 The dwarf variegated cultivars, such as 'Ogon janome', 'Tanima no yuki' and 'Goldilocks', can also die if the rootstock is removed after the first year. We keep ours on for at least four years, with an annual project to keep the rootstock reduced. 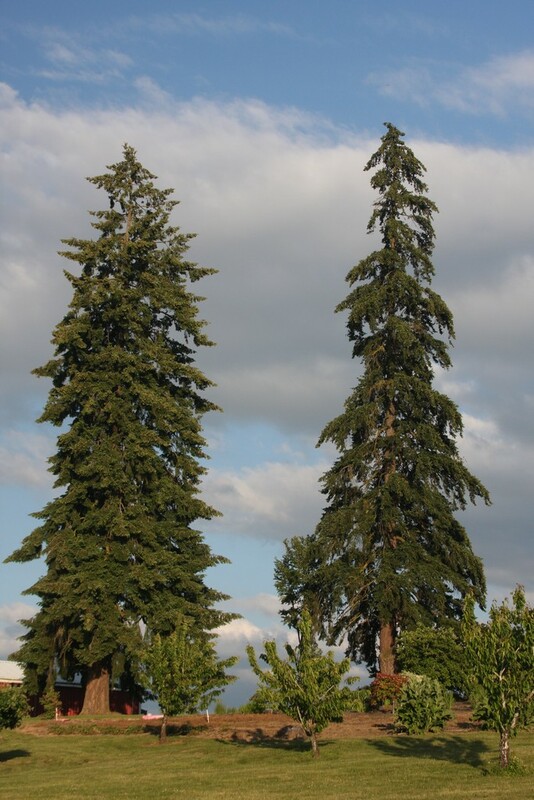 *Attached directly by its base without a stock or peduncle. 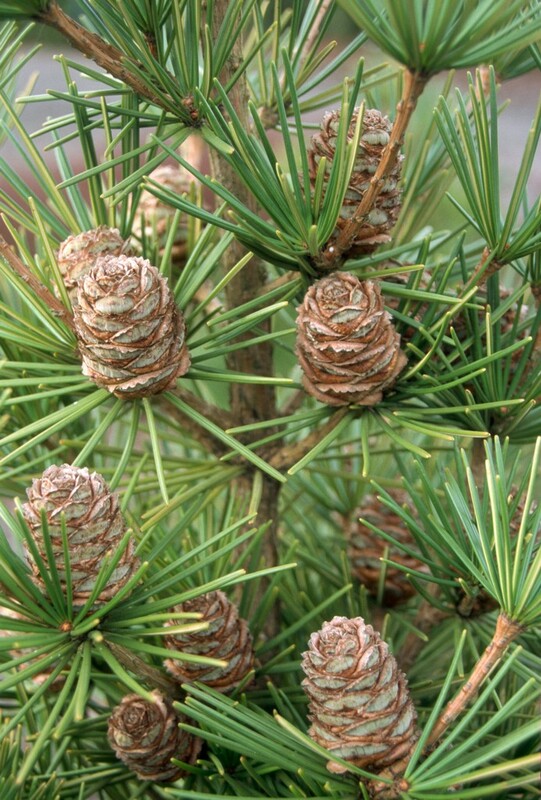 Well, except for Pinus bungeana which I like even more. 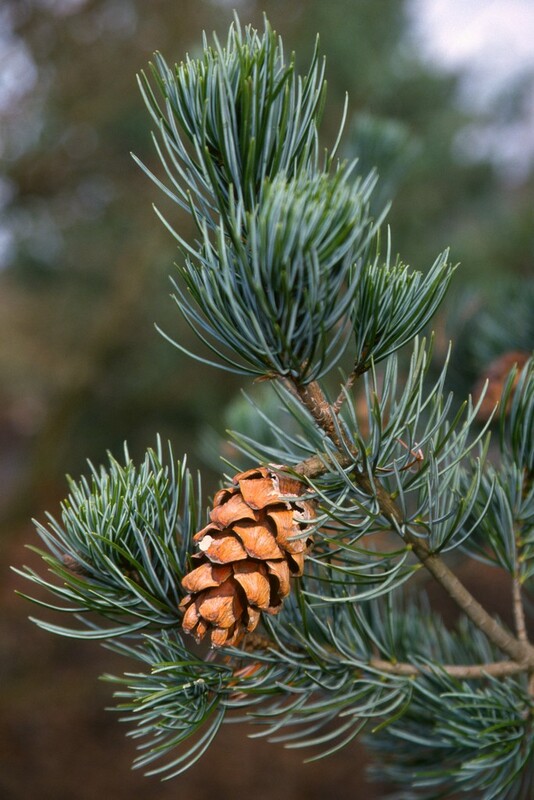 It is grown primarily for its attractive exfoliating bark, without which it would be considered another boring green pine. 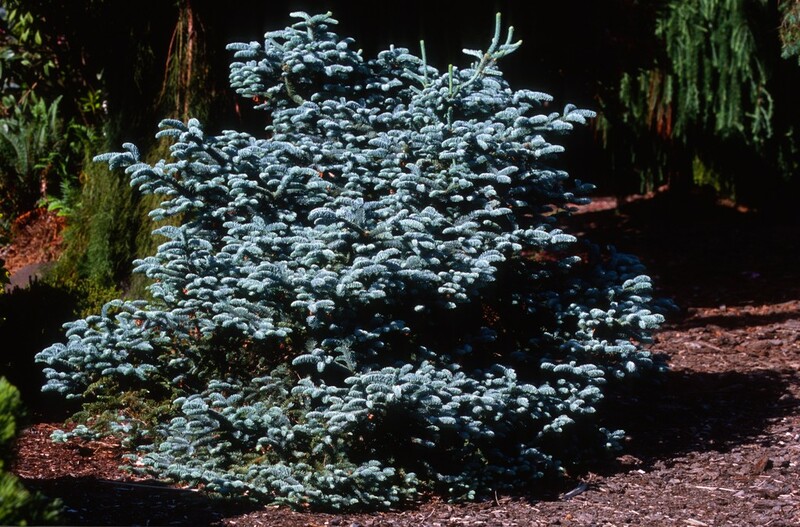 It is not endangered, but many of the low-elevation stands have been eliminated for other uses. 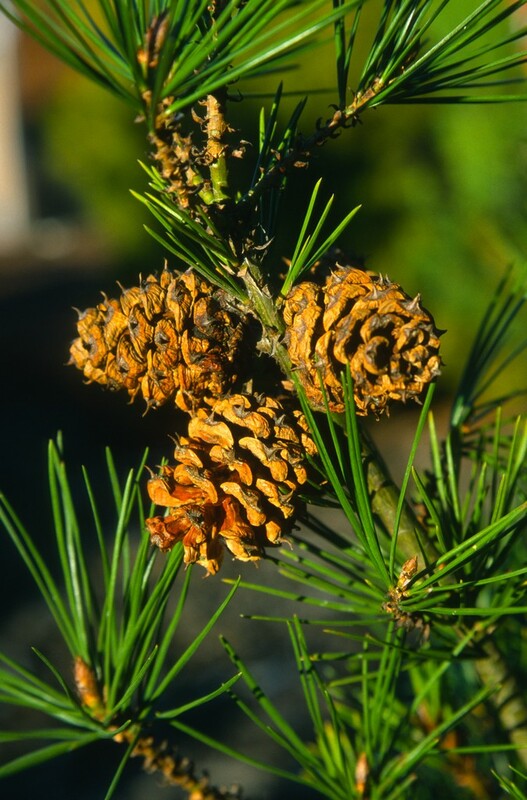 Large specimens are frequent around monasteries and temples, and the pine nuts are considered a delicacy. 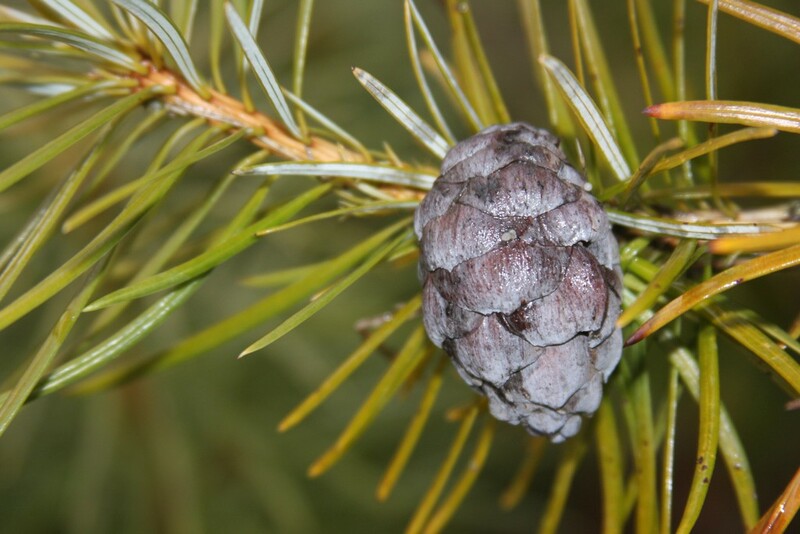 The species is named for Alexander George von Bunge (1803-1890), a Baltic German botanist who travelled in Siberia, Mongolia, China and Afghanistan. 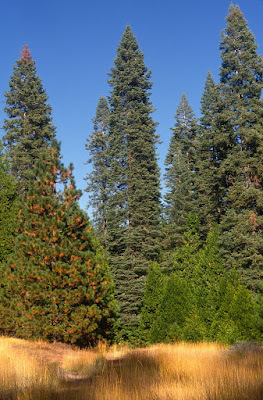 Besides the pine, many plant species were named for him: Pulsatilla bungeana, Euonymus bungeanus, Allium bungei, Fraxinus bungeana, Clerodendrum bungei, Catalpa bungei and Iris bungei. 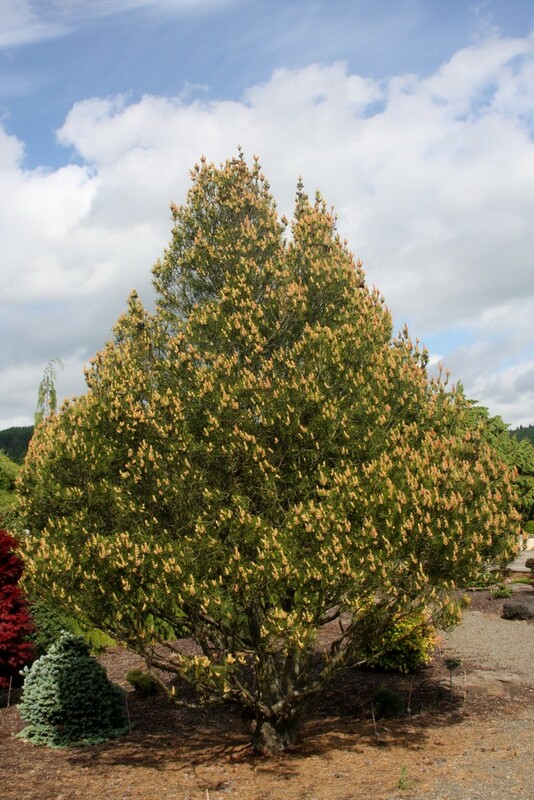 A number of cultivars of P. bungeana include 'Diamant', 'Great Wall', 'Compact Form', 'REL WB', 'Silver Ghost' and 'Temple Gem', the latter a Buchholz Nursery introduction from the 1990's. Pseudotsuga is an interesting genus, growing from British Columbia to Mexico and east to the Rockies, as well as in Asia. 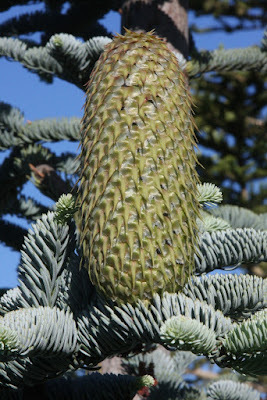 I have collected a few species which are compatible by grafting onto P. menziesii, such as P. sinensis, P. sinensis var. gaussenii, P. japonica, and cultivars of P. menziesii. 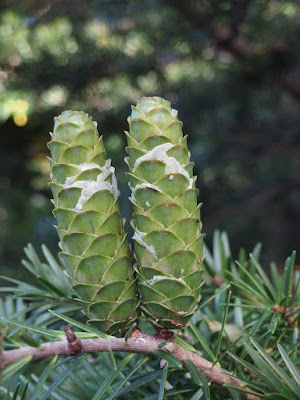 The Asian species have interesting female cones, and near my two huge menziesii specimens at Flora Farm I planted a P. japonica and P. sinensis for added company. All of them are in the coning stage, and it would be fun to create hybrids, but I just don't have the time to fool around with another project. If a reputable person or institution would like some seed I would be happy to oblige. 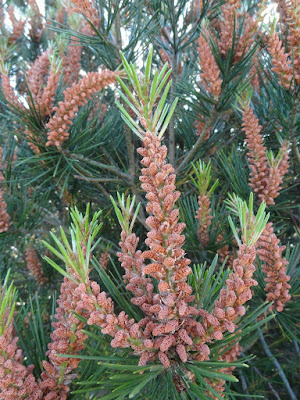 Sciadopitys verticillata displays female cones that bear a close resemblance to those of Sequoiadendron giganteum, and both genera are in the Taxodiaceae family. 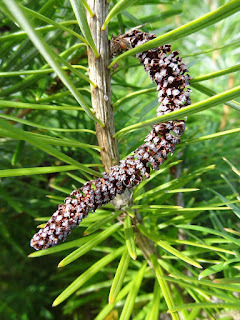 The specific name verticillata and the common name “Umbrella pine” are due to the arrangement of the foliage which resembles the spokes of an umbrella. The Japanese name is Maki, or Koya maki, because an impressive stand exists on Koya san – Koya Mountain – in Wakayama Prefecture. Hillier chimes in that Sciadopitys was “first introduced as a single plant by Thomas Lobb in 1853, later by Robert Fortune and J.G. 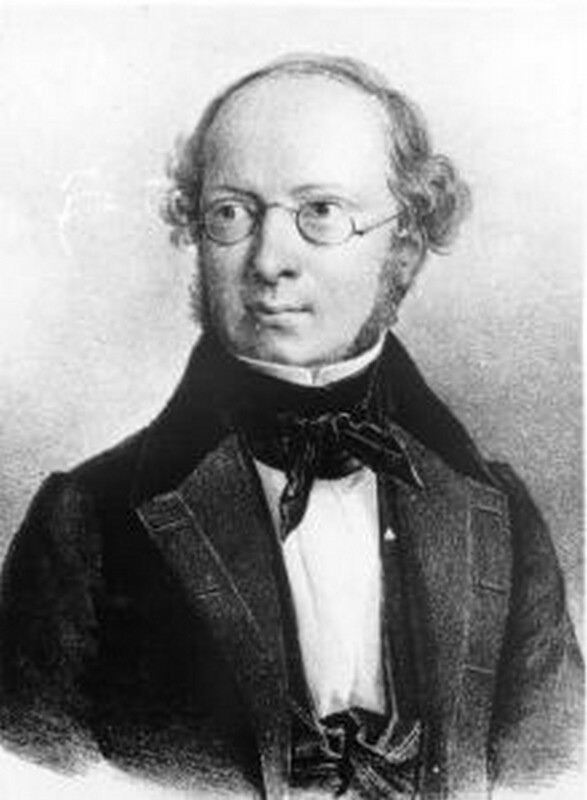 Veitch in 1861,” but it was Philipp von Siebold who first described it. We don't sell many of the straight species anymore, but rather use it as understock for a myriad of cultivars (which are in high demand). 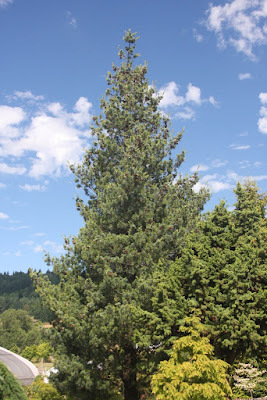 I have not seen this evergreen conifer in Japan, and surprisingly the tallest specimen that I am aware of resides in my home-town of Forest Grove, Oregon, just five miles from my nursery. 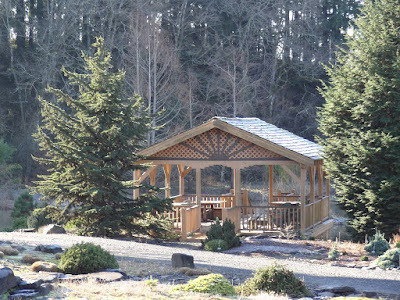 An odd coincidence is that the carpenter of my pond house lived in the house next to the tall Sciadopitys in Forest Grove while his wife was attending Pacific University. He built it for free labor, while I provided the supplies, but the day he finished – about 30 years ago – he has never since returned. 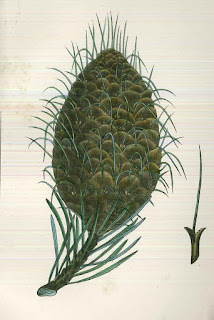 Keteleeria davidiana var. 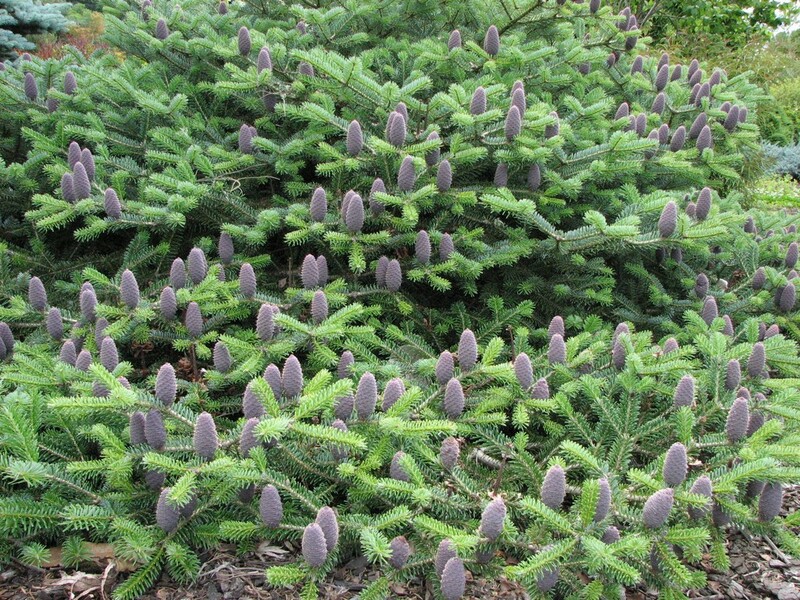 davidiana is seldom encountered in modern gardens due to a) their large proportions and b) cold-hardiness issues. Imagine my surprise when I saw a good-sized specimen crammed in the Plant Delights Nursery's display garden in Raleigh, North Carolina. They get as cold as we do in Oregon, so apparently the Chinese K. davidiana is more cold-hardy than the other species. My interest is primarily due to the large erect cones which resemble an Abies on steroids, but I have never grown any species. 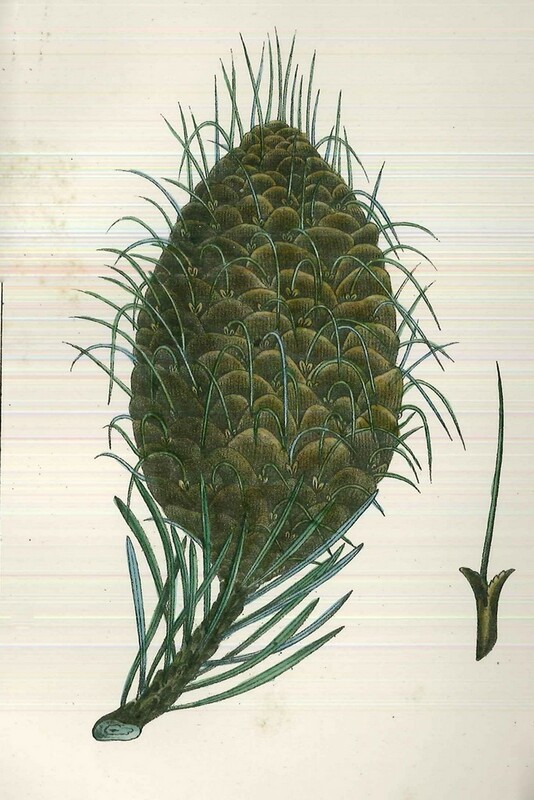 The genus name honors J.B. Keteleer (1813-1903), a French nurseryman. 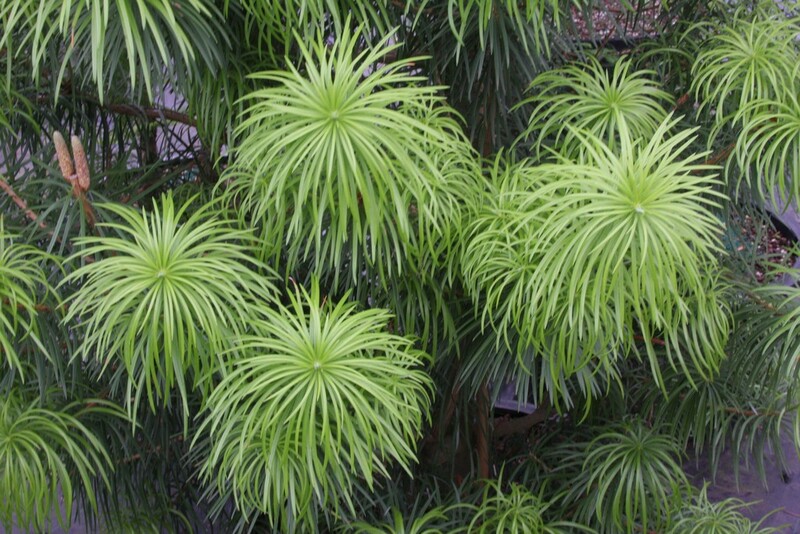 Cathaya argyrophylla is a monotypic genus* discovered in the mid-1950's, and is native to central and southern China. 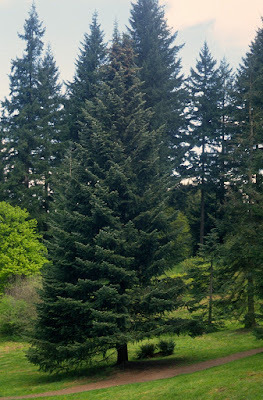 It is surprising that from its provenance it would be hardy in Oregon, but it has survived some brutal winter frosts. 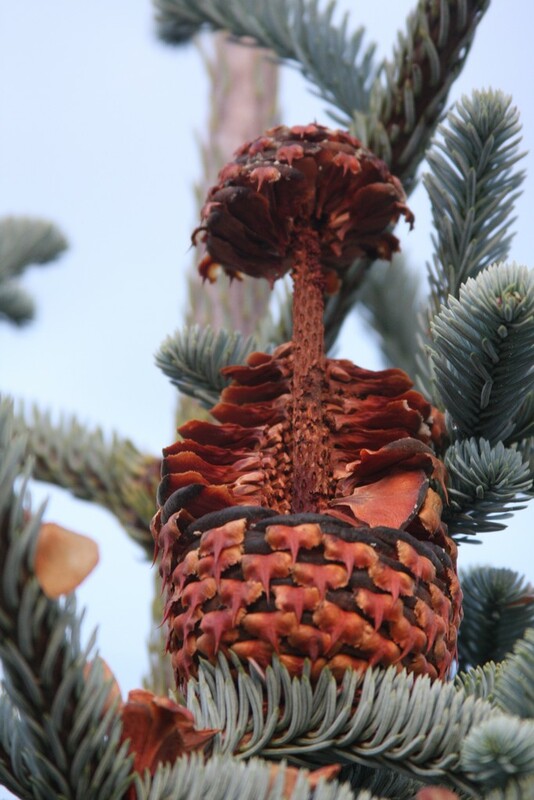 The female cones are unimpressive in size, shape and color, while the male flowers dangle catkin-like with no particular ornamental value. The specific name argyrophylla translates as “silvery leaves” due to the color of the leaves' undersides. 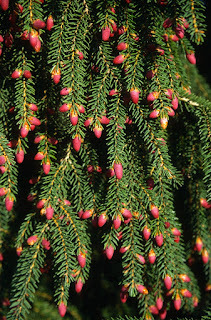 In Rushforth's Conifers (copyright 1987) he reminds us that Cathaya “has yet to be introduced,” which was correct at the time because the Chinese wouldn't allow its release to western horticulture. We eventually acquired it in the early 1990's, as seed which easily germinated. 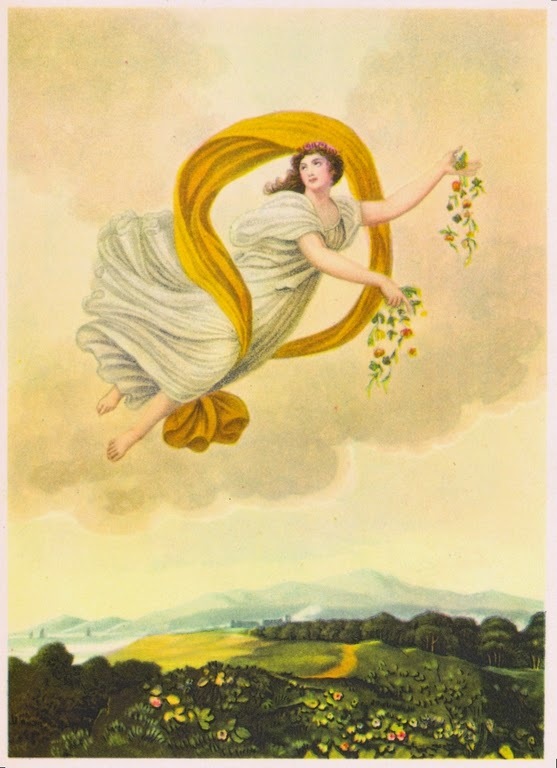 Now we are harvesting viable seed from our early collections, so we don't need no stinking Chinese official to prevent us from growing and selling Cathaya. Cathay is an alternate word for “China,” and is the Anglicized version of Catai which originates from the word Khitan, the name of a nomadic people who ruled much of Northern China. I have flown on a Cathay Pacific Airliner, which is the flag carrier of Hong Kong. 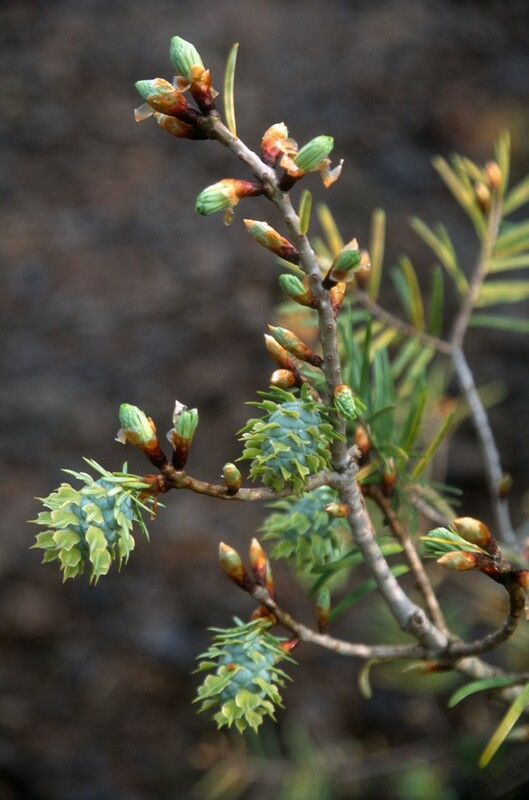 *Cathaya argyrophylla was described in 1962 by Chun and Kuang, but in 1960 it was proposed by Greguss to be Pseudotsuga argyrophylla. I'll conclude with my assertion that coniferous species are every-bit as much a “wildflower” as are gentians, calochortus and lilies. That old pine tree meets the criteria, and hopefully today's blog will inspire you readers to study the sexual expressions of coniferous species. 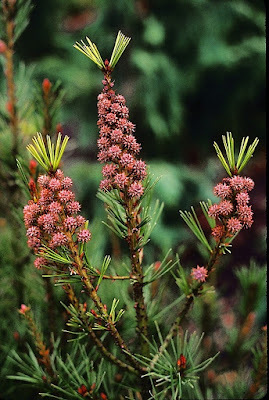 Last week's Flora Wonder Blog was inspired* by ye olde Englishman Humphrey Welch's Manual of Dwarf Conifers, but I suspect that it was tedious for many of you. A dusty tome on conifers – most no longer relevant – can be difficult to swallow, and you would probably have been more engaged with something more attractive...like wildflowers. 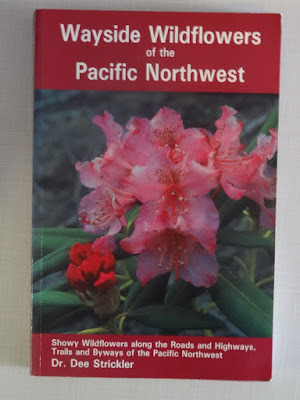 So I pulled from the shelf Wayside Wildflowers of the Pacific Northwest and hopefully this will be a more-fun blog. *Inspire is derived from Latin in "into" and spirare "to breathe." 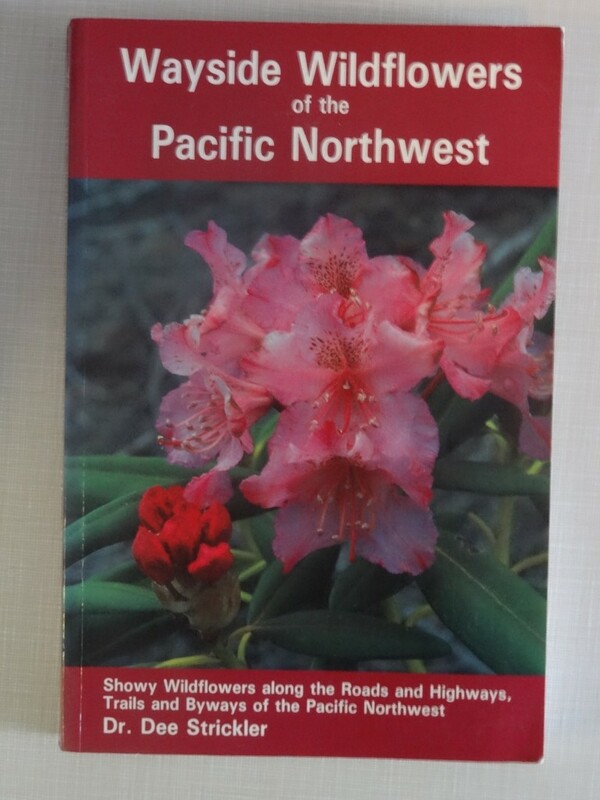 The wildflower book by Dr. Dee Strickler promises us "Showy wildflowers along the Roads and Highways, Trails and Byways of the Pacific Northwest." 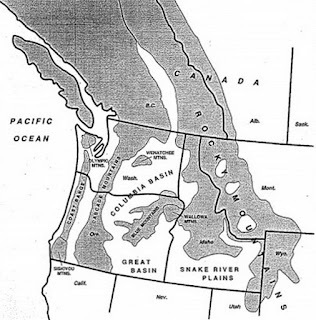 As you can see from the map above – with the risk of plagiarism, since I copied it with good intention from the book – Strickler takes the broad view of "Pacific Northwest," and extends it to Montana, Wyoming and the northeast of Utah. I am an outdoors kind of guy, and I know a few things about native plants, but I have to admit that I have never seen, or can't remember seeing many of the plants contained in the book. All of the (pretty good) photos are of flowers, and I suppose I may have passed many of the plants when they were out of bloom. 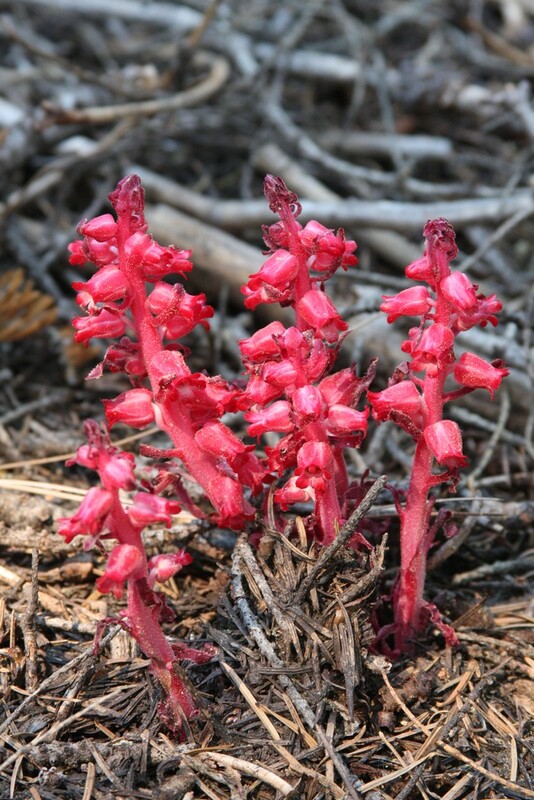 One plant that I definitely have seen is Sarcodes sanguinea, commonly known as the "snow plant" as it blooms soon after the snow melts in spring. Strickler writes, "This spectacular, all red plant can be mistaken for no other and, once seen, cannot be forgotten." That's exactly how I felt when I first saw it when hiking in Southern Oregon with my then girlfriend, and later that day we allowed our ardor to consume us. Sarcodes contains no chlorophyll, and it feeds itself with decayed duff from the forest floor, as do other saprophytes. It is a parasitic plant in the sense that it receives nutrients and water from mycorrhizal fungi which are present on a tree's roots. 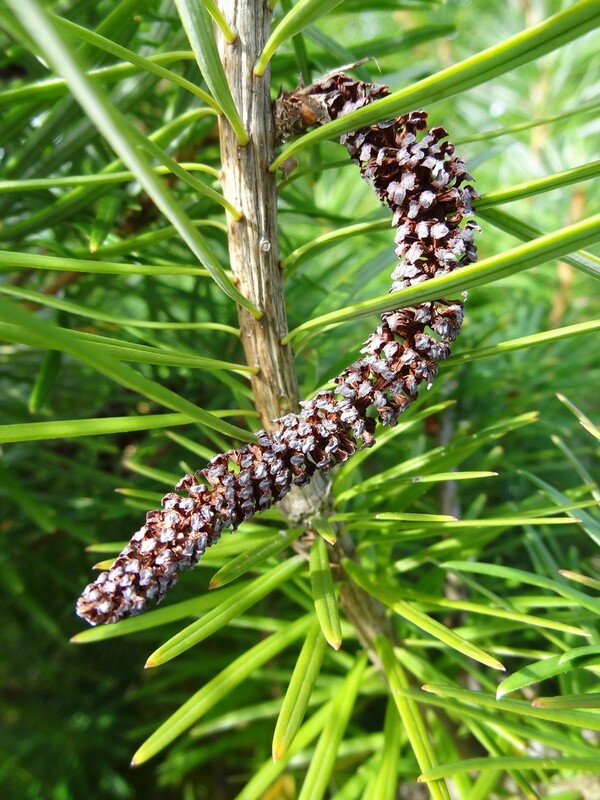 The flower spike in return provides fixed carbon to the fungus, a symbiotic relationship known as mutualism. The generic name Sarcodes is derived from Greek sarkodes which means "resembling flesh" and the specific name is from Latin meaning "blood-red." Wow! 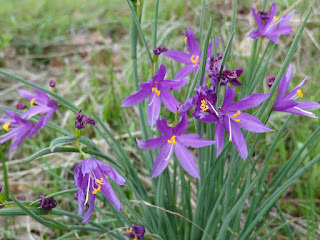 Sisyrinchium douglasii is now known as Olsynium douglasii according to Strickler, but I have no clue why it receives its common name of "Grass widow." 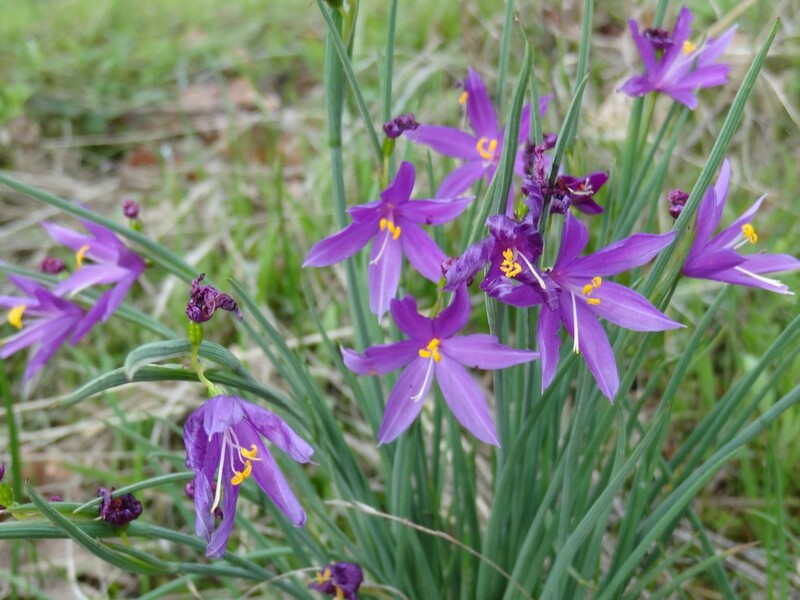 He relates that "If a member of the iris or lily families appears to have six uniform petals, they will in reality be three petals and three sepals, collectively called tepals." I don't know, they all look alike to me. Olsynium is a small perennial herbaceous plant rising from a bulb, and my favorite place to see them is at Catherine Creek along the Columbia River Gorge. 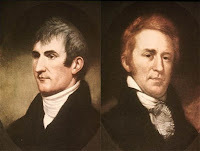 It was discovered in 1826 by David Douglas near Celilo Falls on the Columbia River, twenty miles or so downstream from Catherine Creek. It can cover great acreage on the slopes, and as you hike the area you try your best to not step on any. Occasionally you will spot an albino form; but you don't set out to "find" one, as that won't work. If it wants to be seen it will let you know. 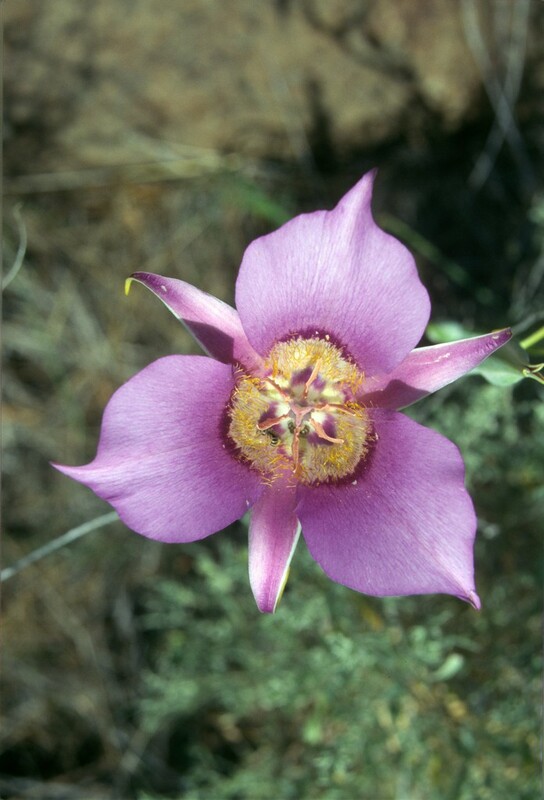 Calochortus macrocarpus can bloom from white to lavender or purple, and is found from dry open prairies to moderate elevations in the mountains. This photo was taken at Oregon's Smith Rock State Park which is world-famous for rock climbing. Personally I don't climb steep cliffs, but it's fun to watch the knarly dudes from below. 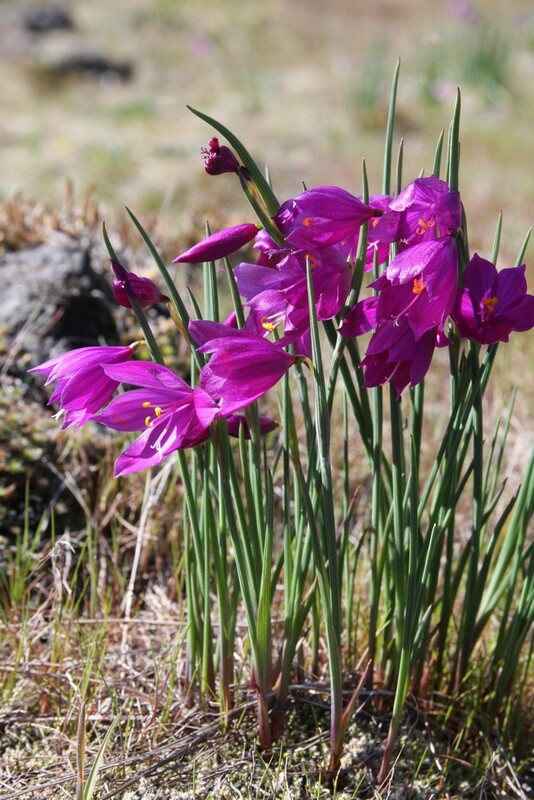 Like the Olsynium, Calochortus is a bulbous perennial in the Liliaceae family, and it is commonly known as the "Sagebrush mariposa lily." The bulb tapers like a carrot and Native Americans ate them raw or cooked, but I've never tried one. Be alerted, however, as some species of Calochortus are toxic, and those were given as presents to their enemies. Who discovered C. macrocarpus? 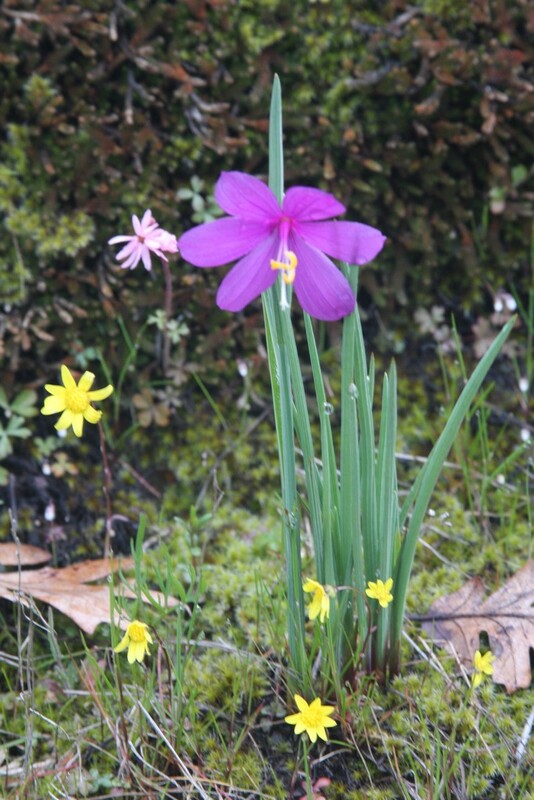 The same guy who found the Olsynium, David Douglas. The generic name is from Greek for "beautiful grass," a name that sounds much better than "widow grass." 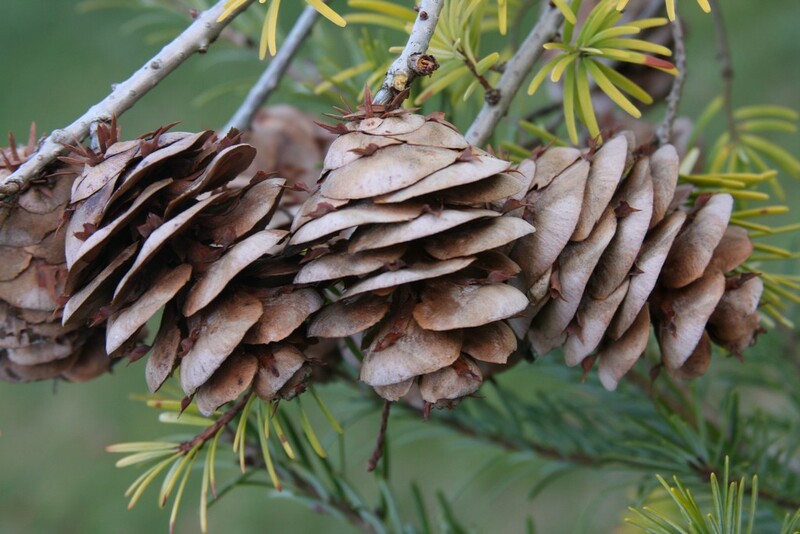 If you ever get the urge to collect C. macrocarpus, or any of the other 65 western species, you must keep the bulbs completely dry from mid-summer to late fall. Also you need to protect them from gophers, moles and squirrels, as with all bulbs in Liliaceae family – and we have learned that the hard way, from experience. 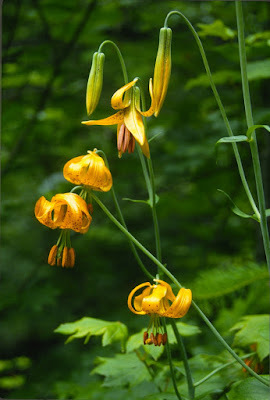 Lilium columbianum is commonly known as "Tiger lily," a beautiful species that I used to see in my Buchholz Nursery woods before the ivy and blackberries prevailed. I first discovered the lily as a young boy on fishing trips with my father, along moist stream banks amongst the "salmonberry," Rubus spectabilis. As with the Calochortus mentioned previously, L. columbianum was eaten by Native Americans and it is reported to have a peppery taste, but I can't bear the thought of digging up a beautiful plant to test its taste. You'll be happy to know that it is pollinated by rufous hummingbirds, Selasphorus rufus, and also by the swallowtail butterfly, Papilio eurymedon. 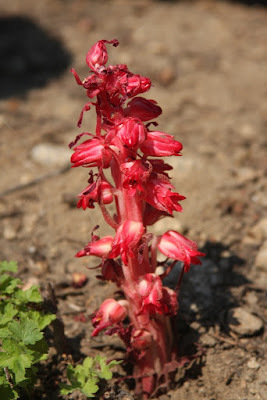 Although my photo above is rather puny, the species can produce up to 30 flowers per stem, and I wish that I could know of a source to purchase bulbs, for I would attempt to grow it in the Flora Wonder Arboretum, especially since I haven't seen it in my woods for at least fifteen years. Did you know that the name lily is from Greek leirion, then to Latin lilium, then to Old English lilie? 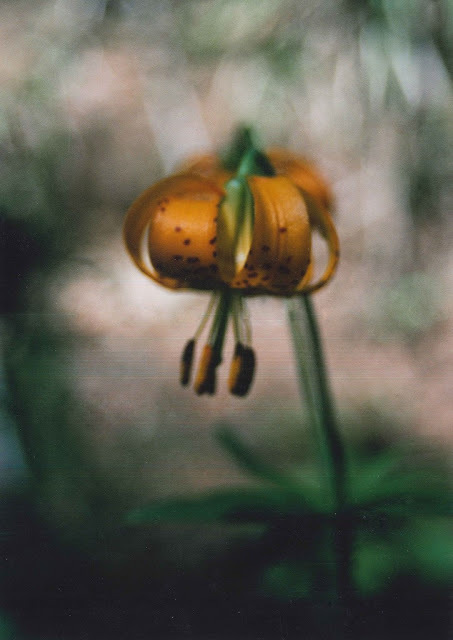 The lily word is used in the Old Testament to translate the Hebrew shoshanna, and in the New Testament to translate the Greek krinon, the latter a name for the Crinon genus. Strickler goes biblical when he quotes from Matthew 6:28: Consider the lilies of the field, how they grow, they never toil nor spin; yet I tell you, even Solomon in all his glory was not arrayed like one of these. 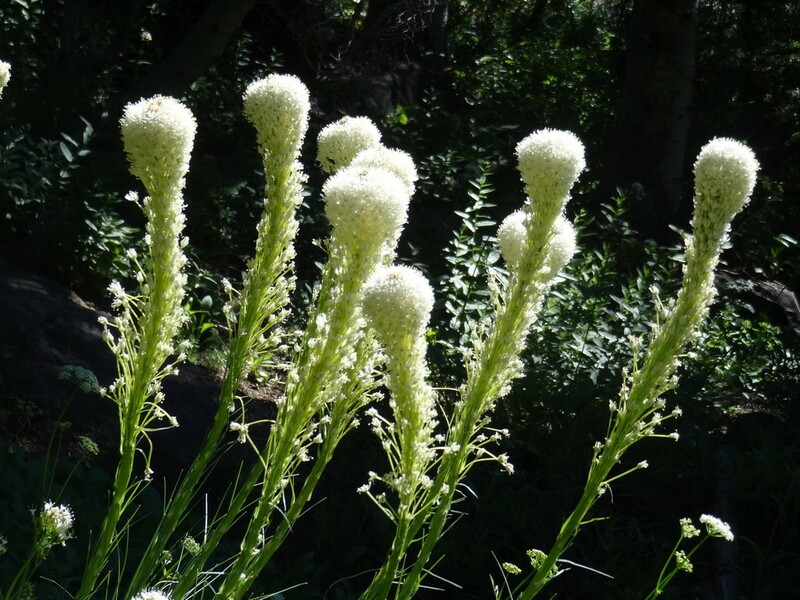 Xerophyllum tenax can be found in western USA states and Canada and is commonly known as "Indian Basket Grass" or "Beargrass." 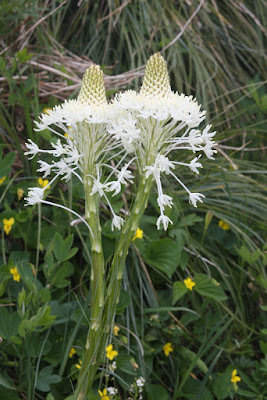 It resides at mid-level elevation, and blooms between June to early August. 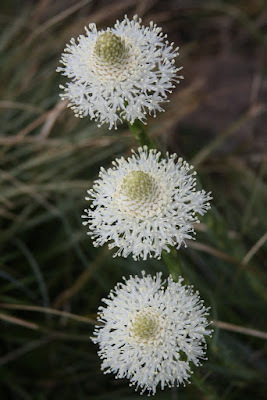 Strickler comments that "Beargrass is the official flower of Glacier National Park. Rocky mountain goats eat the tough evergreen leaves in winter and many game animals feed on the succulent flower buds and stems in spring. In the early days Indians wove baskets, cloth and utensils from the coarse leaves." 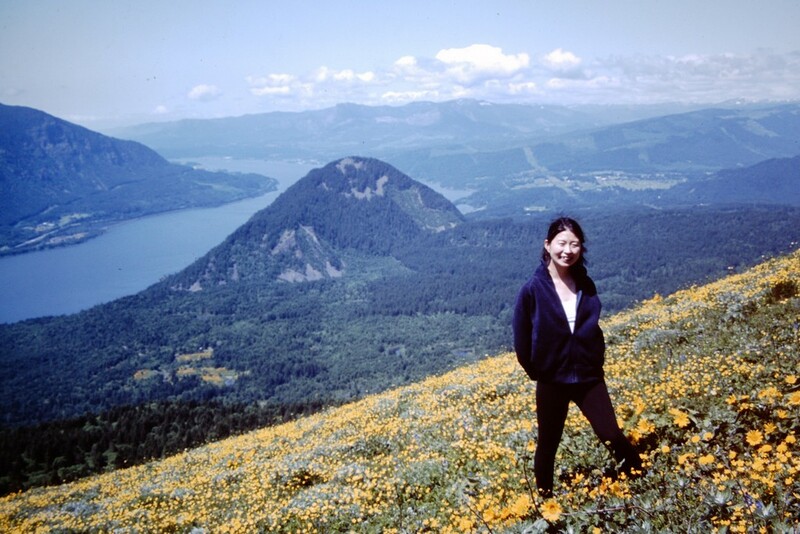 On one hike I used to regularly take on Mt. Hood, the beargrass was normally encountered at the 4,000' – to – 5,500' range, and in some years it was photographically thick but in other years it wasn't so abundant. 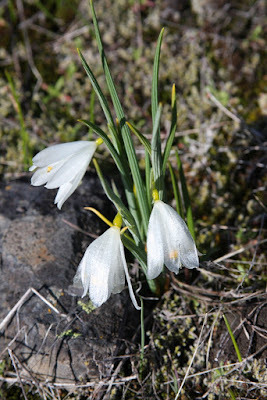 I was amazed to learn, years ago, that X. tenax was not a true grass, but is rather classified as a lily in the Order Liliales and is related to the genera Trillium and Paris. 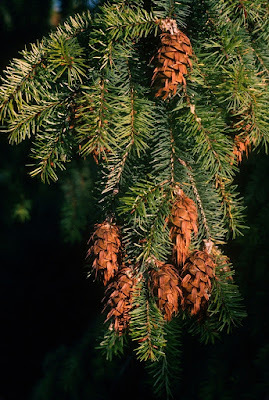 The botanical name is derived from Greek xeros for "dry" and phyllon for "leaf," and the specific name tenax is Latin for "grasping" or "tenacious." And yes, it is also a food source for bears. I'll never forget one time on Silver Star Mountain in Washington state, when one early-spring the wind was howling which caused the dry flower spikes to spear me in the face, and I had to cover my eyes when walking. 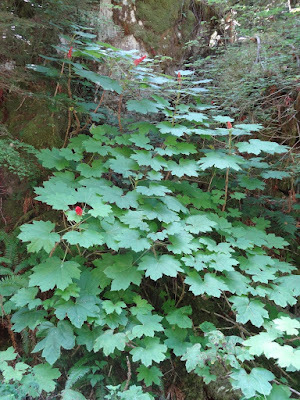 I encounter the "Devil's Club," Oplopanax horridum* when hiking, and the specific name is due to spines on the under-leaf and stems which would tear you to shreds if you fell into a patch. 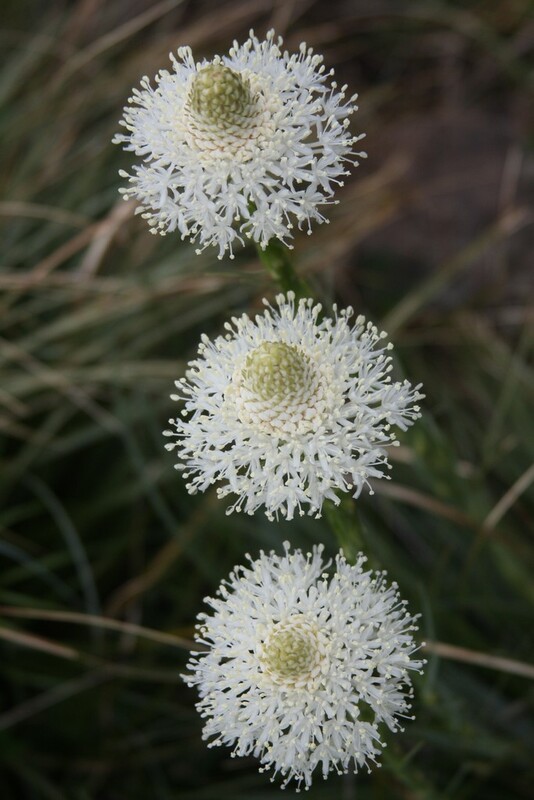 Flowers are small with five greenish-white petals, but they are not a thing of beauty. The fruit is attractive however for its shiny red color. 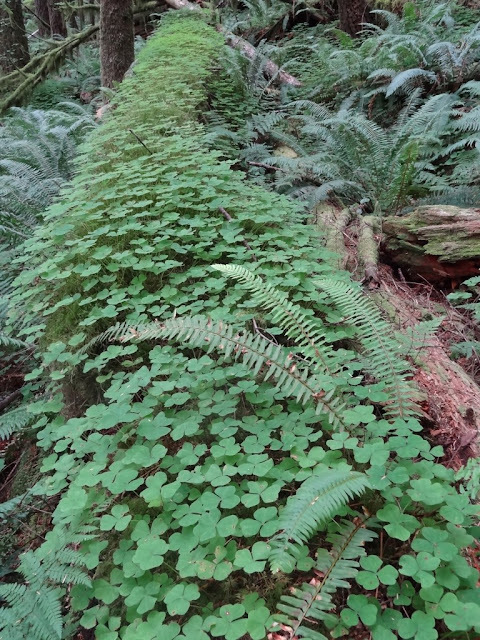 The Devil's club is found along stream banks and under a canopy of western red cedar, Thuja plicata, and western hemlock, Tsuga heterophylla. Plants display huge palmate leaves and can rise to 15 feet in favorable conditions. I agree with more than one who comments that the plant looks primordial, like it would make dinosaur food. 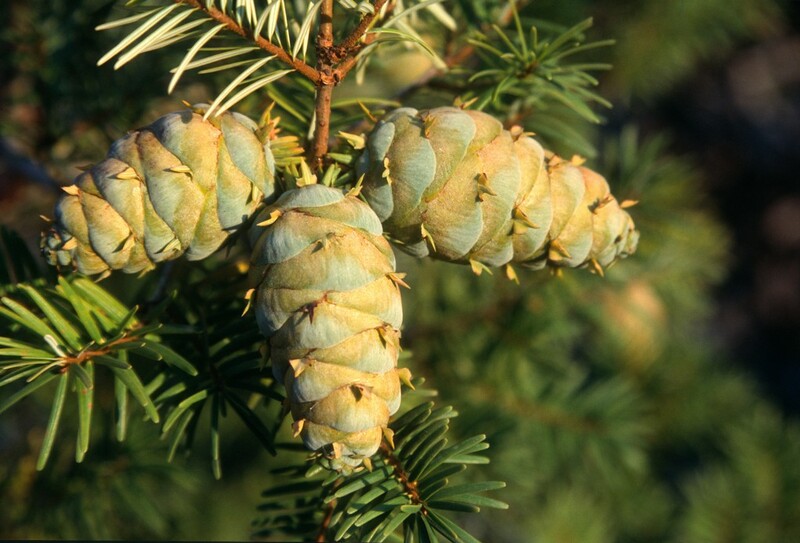 Naturally Native Americans used the plant medicinally, to treat diabetes and rheumatoid arthritis. 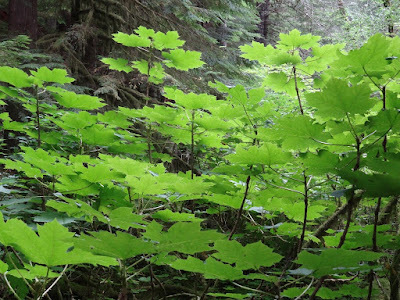 In southeast Alaska the natives would also hang a branch over a doorway to protect the inhabitants from evil. 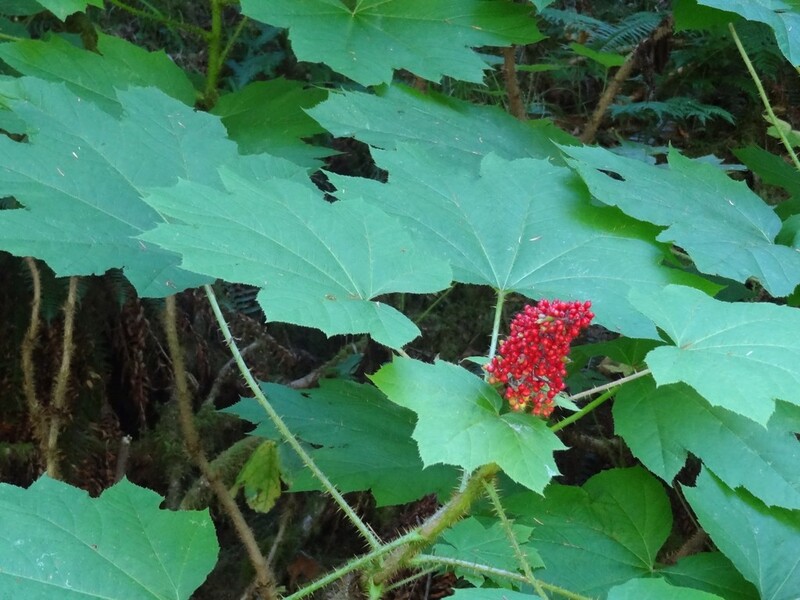 In Alaska hippies and health freaks used to harvest Devil's club as if it's the same as American ginseng, but it's not, and now it is illegal to peddle it so. 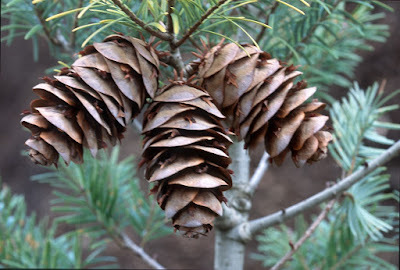 *I've seen it listed as horridus also. "Arrowleaf Balsam root," Balsamorhiza sagittata, is found from British Columbia to California and into Colorado. 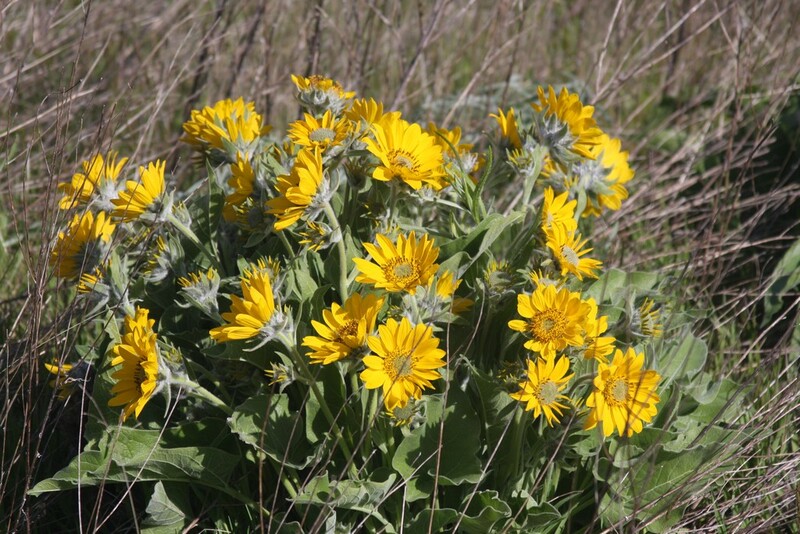 It is in the sunflower family, Asteraceae, and it can be a marvel to see an entire hillside covered in yellow, such as can be found on Dog Mountain in the Columbia River Gorge. Native Americans used it for treating minor wounds, and also as a source of food – the roots – during lean times. While the large taproot is nutritious it contains a bitter sap, and I have never tried it. 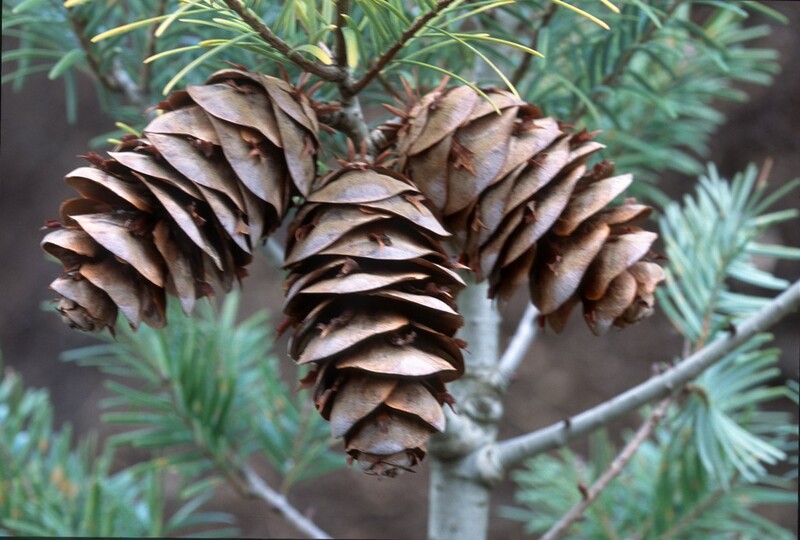 It can survive on arid hillsides because of the long root which can grow to a depth of eight feet, and root laterals that grow to three feet. 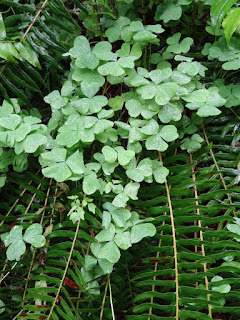 Oxalis oregana can bloom white to pink, and the "Redwood Sorrel" makes a luxuriant ground cover on the forest floor. Be careful where you site it however, as it will continue to spread until the end of time. 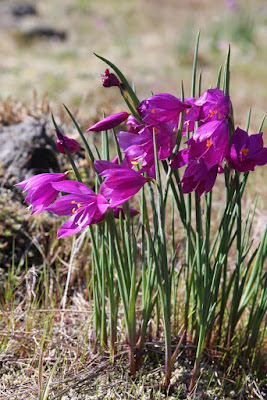 The flowers bloom from April to May in (Oregon), but interestingly it has a habit to not bloom in wet, cloudy weather. 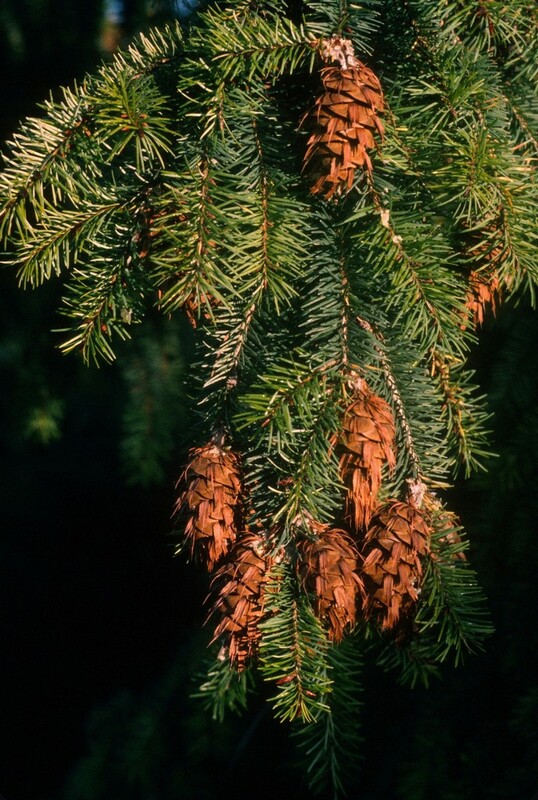 Also, it photosynthesizes at low levels of light, and if during a sunny day it receives direct sunlight the leaves will curl downward. When shade returns the leaves will reopen, and this change only takes a few minutes. Sounds to me like a fun nature project with the kids, and if anybody wants a start I'll be happy to supply you. Native Americans were known to eat the leaves, although they contain a mildly toxic acid, and my father taught me that they could be eaten in case I was stranded in the forest. Eschscholzia californica is the "California poppy," and it can also cover entire hillsides. It is also California's state flower. California is known as the "golden state," but the name has nothing to do with the gold rush or to rich movie stars in Hollywood, but rather due to the poppy. 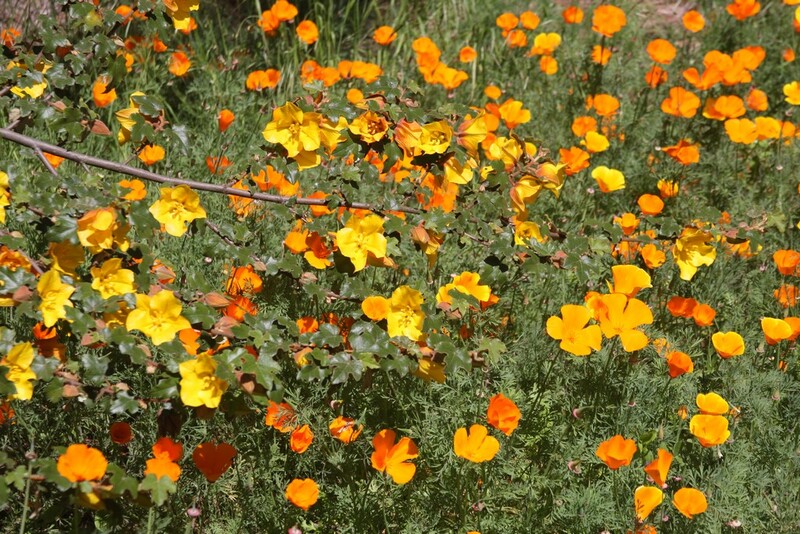 In fact it was selected as the state flower by the California State Floral Society in 1890, and April 6th of every year you can celebrate California Poppy Day. Again, Native Americans used the leaves medicinally, and if you chew on it you'll receive a sedative, anxiolytic (non-anxiety) effect. 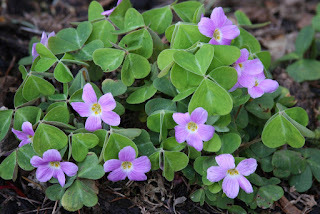 E. californica has received the RHS's Award of Garden Merit, and now there are cultivars which range in color from purple to white. The plant was named by the German botanist Adelbert von Chamisso for his friend and colleague Johan Friedrich von Eschscholtz when they were on a scientific expedition in California around 1815. 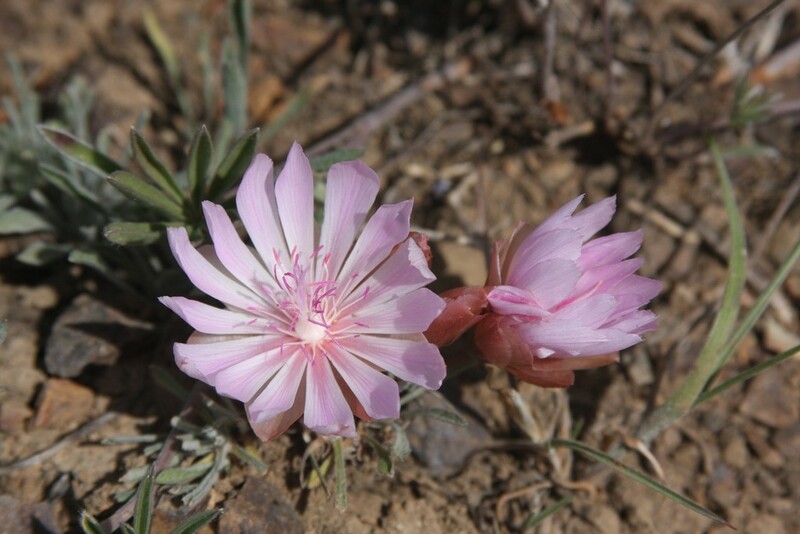 Lewisia was named for the famous explorer who led the Lewis and Clark Expedition to Oregon from 1804-1806, but don't worry because William Clark also has a genus named for him (Clarkia). Lewisia rediviva, a member of the purslane family, is the state flower of Montana. 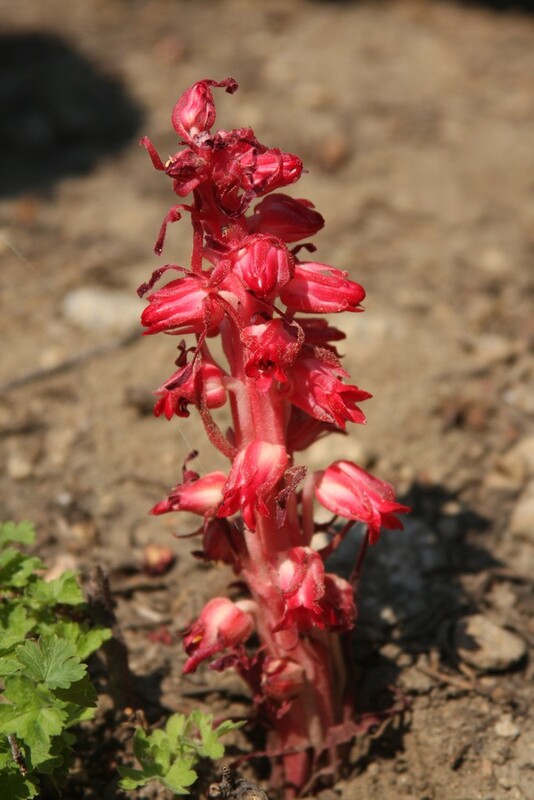 Its roots are also edible, but you guessed it—not so tasty – for its common name is "bitterroot," which the French trappers referred to as raceme amer. To the Cheyenne Tribe it was called mo otaa heseeo otse which translates as "black medicine," and some tribes thought the taproot had special powers such as being able to stop a bear. Geographically, the Bitterroot Mountains run from north to south and separate Montana from Idaho, and the photo above was taken in southern Idaho. Lewisia rediviva thrives on rocky soil with little or no moisture, and the low-growing genus is perfect for the rock garden. The specific name rediviva occurred when a plant was sent to England which arrived in a withered state; but to everyone's surprise it revived, then thrived. Holodiscus discolor is known as "Ocean Spray" or "Mountain Spray," and in fact there is a bush of it along Vandehey Road, just steps away from the nursery. 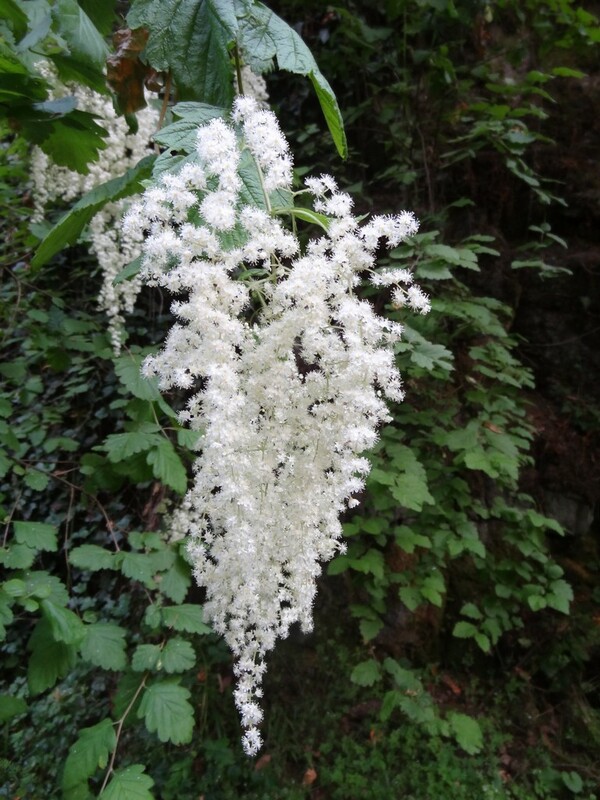 The common name is due to the pendulous creamy-white flower clusters which reminds one of waves breaking on the ocean shore. Eventually the flowers turn to an ugly brown, but they remain on the plant and provide seeds for birds throughout winter. While the blossoms are attractive I would never plant the 15-foot bush in my landscape, and in fact, I have never seen it used in any garden. 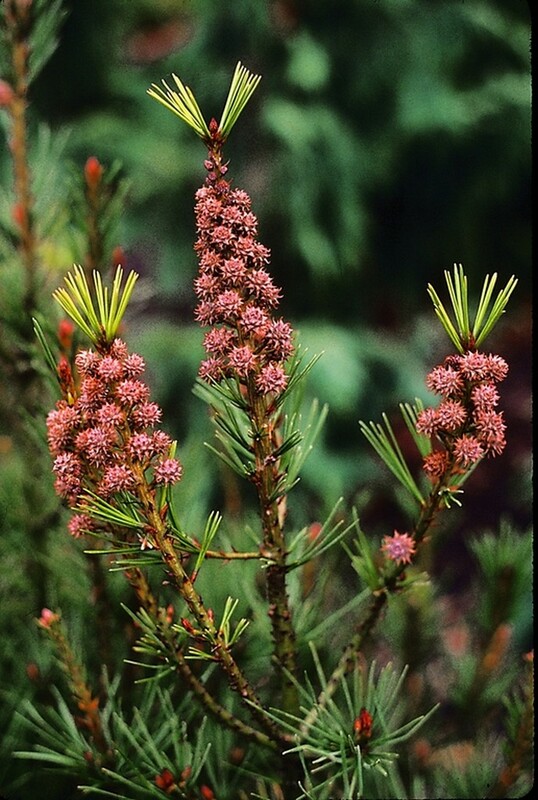 The Lummi Tribe used the flowers as an antidiarrheal and other tribes use the branch wood – also known as "Ironwood" – for making tools like digging sticks, spears, arrows, harpoons and nails. This member of the rose (Rosaceae) family receives its generic name from Greek meaning "entire disc," in reference to a section of the flower, and discolor is due to it being "two colored" with leaves green above and gray below. Let's face it: flowers are more fun than ancient conifers, and hopefully I have made up for the previous blog. 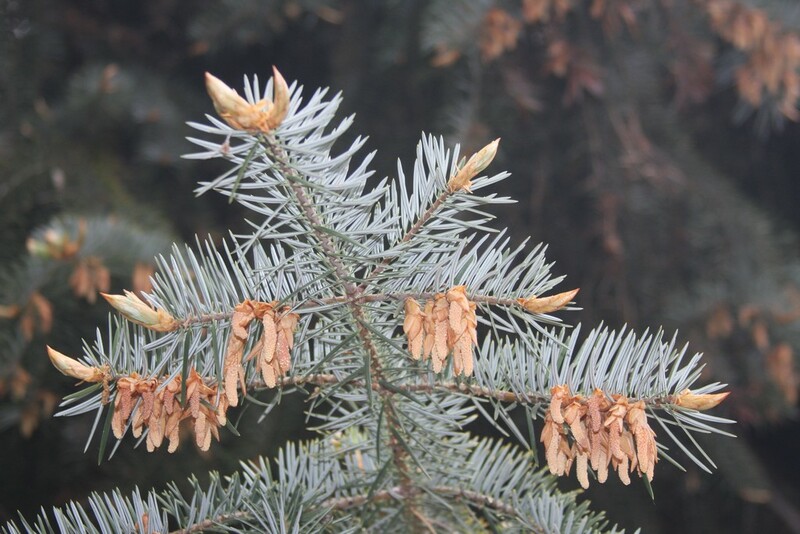 But don't forget that conifers flower too, but just express themselves in a different way. 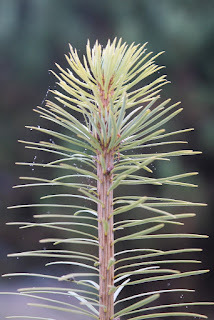 The Flora Wonder Blog is not necessarily provided for your amusement – though I hope it does – but primarily as an autobiography of what I have seen and subsequently learned. "Thank you Talon, and even though you can be long-winded and trivial, I do appreciate your efforts."